"Easy management and deployment with Distelli "
Management through Distelli is fantastically simple to setup and use. With insignificant exertion you can push your applications to various servers over numerous situations all with interesting designs. Our group has been utilizing Distelli for over a year and it has streamlined our convey procedure, making arrangements smoother, speedier, and more dependable. Like any youthful organization, they've had some issues, however they've generally endeavored to determine them, and for the most part do as such rapidly. As of right now, I don't have any significant protestations given our present utilization of Distelli - it bolsters our requirements flawlessly. Distelli has been a fabulous device for our group both underway and in test, permitting us to rapidly switch between various forms and rapidly redesign to another form or recuperate to an old form. As a light-footed group, it's vital to us to have the capacity to send rapidly and to convey regularly. The simple interface and easy build and deploy workflow. With minimal effort you can push your applications to numerous servers across multiple environments all with unique configurations. I can also check all my deployments in one organized console and make adjustments with a single click. The team at Distelli responds very quickly to questions and address feedback properly. The interface has many layers and sometimes navigating between unrelated features is cumbersome. There are some quirks about the UI that hinder usability but I have only noticed them in rarely used features. Just try it, you won't regret it. They solved the problem of how to automate the deployment of my applications to many environments of varying configurations. I no longer have to spend time making sure everything gets deployed or what is malfunctinoing - Distelli does it for me. "Distelli makes it dead easy to build and deploy all our apps"
* The Distelli agent and CLI are easy to install and setup. * The manifest file can be dead simple for basic use cases, or as complex as I need it to be for other cases. They provide tons of examples. * The Distelli web interface is well designed and responsive. Pipelines in particular is fantastic: I can visualize and shepherd my releases through various stages with minimal effort. * Their documentation is comprehensive. * All my support requests have been resolved quickly to my satisfaction, sometimes within the hour. * The Distelli team has solid technical chops and a passion for dev-ops; I look forward to seeing more innovation from them. I find their web interface takes more clicks than I like to find things. Also, tiny text and low-contrast colors on some elements (e.g. tags) strain my eyes. Some call-to-actions, like the settings button at the right edge of text boxes are not intuitive. From seeing how the Distelli product has evolved over the last year, I think there's more good stuff coming. You should try Distelli out, I'm confident you wont be disappointed. The Evocalize platform can automatically create and manage thousands of personalized creative and targeting alternatives through a system of variables and rules, making personalized mass scale advertising possible for marketers of consumer-facing brands using the brand’s existing content and data, such as product catalog and purchase history. To this end, Distelli is the cornerstone of our dev-ops practices. "Fast, easy to use, well-maintained, great CS"
Our team has been using Distelli for over a year and it has streamlined our deploy process, making deployments smoother, faster, and more reliable. I found the WebUI somewhat difficult to navigate at first, but once you know where to find what you need the app is easy to use. As an agile team, it's important to us to be able to deploy quickly and to deploy often. This also means that we need to be able to roll back to a stable deploy if things go south. Distelli has been a fantastic tool for our team both in production and in test, allowing us to quickly switch between different builds and quickly update to a new build or recover to an old build. The manifest is very powerful and interfacing with github.com and github enterprise is a breeze. Great support as well. Well, it's not fully developed, but whatever feature isn't there, there is a powerful API to interface with. Just try it and contact their support if you get stuck. It's free to try and worth the subscription costs. Our most important problem to solve was interfacing with github.com and github enterprise on pull requests through webhooks. Distelli went above and beyond to make sure we could follow our security standard and still set this up. I've spent months looking at other options and Distelli blew me away how easy it was compared to everything else. "Distelli made our life easy"
The ease of use, reducing the ops time and human errors. Another great thing about distelli is there every ready support team. They have a team of great engineers who never shy off to own and go to great lengths to entertain our special feature requests. Ease of use is another great point, which makes it easy for new engineers to pick it up in no time. Too frequent agent updates. We are not able to have the latest in our AMI. Another important feature is missing CLI support, most of the CLI command do not work. If the CLI works it would make our life much more easier. Deployment and release management. Prior to Distelli we used to have manual scripts to upload and deploy to EC2. It was always error prone, there was no way to rollback or move to another version. "Distelli has made build and deployment management a breeze"
Management through Distelli is incredibly easy to setup and use. New features are added all the time - we love how fast they move. Using it keeps operations overhead to a minimum and saves us a ton of time. As of right now, I don't have any major complaints given our current usage of Distelli - it supports our needs perfectly. Distelli really does make deployments simple. With their somewhat recent addition of their Pipelines feature, managing deployment pipelines is incredibly easy to setup and to maintain. We manage deployments to multiple services + release management to multiple EC2 instances. Using Distelli has made this very easy and has reduced a lot of operational time. Especially whenever we need to do a quick rollback. "Adventures with a new deployment system"
Its first major benefit for us is really fast rollback. When someone deploys a buggy build (it happens!) we can roll back in a matter of minutes or less. Pretty great. There are some "hidden" features, do ask the creators about any of these, and pressure them to improve the CLI tool! It's important to be able to write your own scripts around the CLI, and the tool is merely OK.
We started using Distelli after living with Capistrano for a while and needing a better overall strategy. "Distelli makes streamlined deployment pipelines easy"
I like github and bit bucket integration. The fact that I can't deploy a docker container. Distelli makes it possible to create a multi-host, multi-environment automated deployment pipeline with ease. This is something that I've been trying to figure out for a while and Distelli solved that in an afternoon. The learning curve is minimal (within an hour or two tops.) I also like how Distelli uses Docker to containerize the test and build environment. They have great documentation and a lot of underlining features that make it possible to customize easily. Great support, great team, great product. I highly recommend. I'm trying to solve the problem of continuous integration workflow. bmcgehee Brian gave me great assistance in setting up my application. He personally helped me debug and solve a complicated issue. It was difficult for me to set up without help. * We monitor all Puppet Pipelines reviews to prevent fraudulent reviews and keep review quality high. We do not post reviews by company employees or direct competitors. Validated reviews require the user to submit a screenshot of the product containing their user ID, in order to verify a user is an actual user of the product. Hi there! 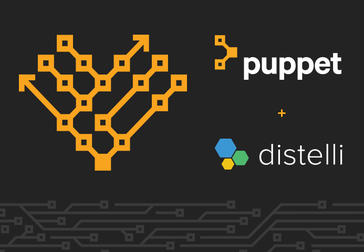 Are you looking to implement a solution like Puppet Pipelines?